BinaryOptionsNow – When it comes to learning to trade binary options then iOption is probably the best place to achieve this. This is because iOption has an extremely large portfolio of binary option educational materials. No matter what you intend to learn, you can find it by visiting iOption’s Knowledge Center. The iOption Academy is the biggest source of knowledge available at iOption. The Academy offers a full set of courses that integrally cover all aspects of the binary options trading business. Courses are being scheduled on a calendar like in the case of a real physical academy, and traders are required to connect during the scheduled hours in order to participate in a course. The courses are held approximately every 5-6 days and cover an extremely large variety of subjects such as trading fundamentals, advanced strategies, bankroll management, tips how to earn money though binary options, and various other extremely useful topics. The best aspect of the Academy is that it offers relevant information to the trader without any fluff talk. The Academy also eliminates the time spent by traders gathering all the information from the internet from third party websites. It’s even highly likely that no material on the internet offers such in-detail advice to traders when it comes to binary options trading than the material available at the iOption Academy. Besides the Academy, iOption also offers a very large selection of learning materials that can be accessed at any time by any trader. One of these is the Knowledge Library that contains a very large selection of guides and texts that explain every aspect of the binary options market. The Knowledge Library is basically an extension of the iOption Academy. It allows traders to quickly browse up all the issues and topics that were mentioned in the courses available at the Academy’s courses. The iOptions Knowledge Library is probably the biggest selection of written instructional materials in the binary options business. Besides the above mentioned large educational tools, iOption provides various smaller and topic specific tools. One of these is the expiry times rules index. This explains all the rules related to expiry times in binary options trading. 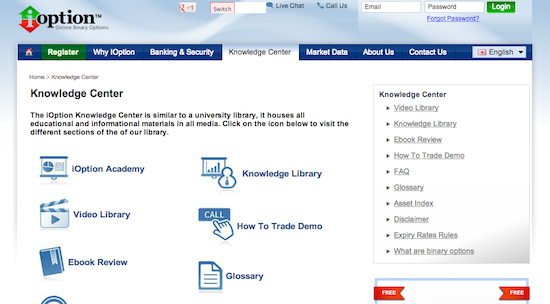 The Knowledge Center also provides a glossary that contains all terms used in the binary options business as well as a video library and a FAQ page. iOption is a solid binary options broker that offers a large selection of services and binary options types. iOption even offers the new 60 seconds binary option type. There are very few brokers on the market that already support this new and exciting type of binary options. The broker also has an options builder tool that allows traders to customize the binary options they intend to trade. iOption also provides a large selection of assets. In fact, it’s one of the brokers with the most assets available. This means that traders will have the opportunity to trade binary options on lesser known and more exotic types of assets. Usually these types of assets also offer better payout rates. iOption is very safe as well. Depositing money at the broker can be done through credit cards, wire transfer and Moneybookers. Traders are also required to prove their identity before they are allowed to trade with real money. This is a standard security practice in the binary options business. Withdrawals are completed by the broker in 3-5 business days. And naturally the biggest plus about iOption is its Knowledge Center. The availability of the many instructional materials at iOption clearly proves that the broker is determined to help new traders achieve success in the binary options business.